PROPERTY developer Tambun Indah Land Bhd is looking to expand to the Klang Valley to tap into the growing demand for residential properties. Tambun Indah, which has some RM60 million in cash reserves, has not decided on any particular land yet but is on the lookout for suitable landbank. "We are eyeing for landbank in the Klang Valley and have viewed some land in Shah Alam and Kajang, but we have not finalised anything yet," said managing director Teh Kiak Seng in Kuala Lumpur. The company also plans to invest some RM178 million to purchase two more parcles of land of about 1.62ha each in Penang next year. Currently, Tambun Indah owns 86ha of land in Penang, with a gross development value (GDV) of about RM1 billion which should keep it busy for the next six years. Last year, it also had some 10 per cent of the residential property market in Seberang Perai, namely through its Tambun Indah development project. "Seberang Perai is one of the fastest growing districts in Penang due to the rise of working class population as a result of rapid industrialisation," he said at the company's prospectus launch yesterday. Tambun Indah is seeking to raise RM22.4 milion from its initial public offering exercise, of which RM12.7 million will be allocated for working capital, RM7.1 million to repay bank borrowings and RM2.6 million for the listing exercise. Of the 32 million new ordinary shares under the public issue, 11.05 million share will be allocated to the public at 70 sen a share. Applications for Tambun Indah's shares close on January 6 2011 and subsequently, the company will be listed on the Main Market of Bursa Malaysia on January 18. Established in 1994, Tambun Indah has completed eight projects, selling more than 2,800 units with a total GDV of more than RM800 million. Its ongoing projects include Pearl Garden, a gated residential project located in Simpang Ampat which is set to be completed in 2016 and Juru Heights in Seberang Perai, a gated residential project that is expected to be completed early next year. KUALA LUMPUR: Tambun Indah Land Bhd, a leading property developer in Penang, is planning to acquire 3.2ha of land next year. Managing director Ir Teh Kiak Seng said the group had identified 1.6ha on the mainland and another 1.6ha on Penang island with a gross development value (GDV) of approximately RM36mil and RM170mil respectively. According to an independent market researcher, the residential property market in Penang was valued at RM3.7bil last year, and the mainland accounted for approximately 30% of Penang's residential property market. “Mainland Penang (Seberang Perai) is one of the fastest growing districts in Penang due largely to a growing working class population as a result of rapid industrialisation,” he said during the launch of the group's initial public offering (IPO) here yesteday. Tambun Indah is scheduled for a main-market listing on Jan 18. “We are still eyeing for landbank in the Klang Valley like in Shah Alam and Kajang but are cautious about the cost; therefore, we have not finalised anything yet. “As we all know, Klang Valley is a good market to do housing, but we want to build our name by building quality homes at an affordable price. We, however, have no plans to expand overseas at the moment,” Teh said. Last year, the group garnered a 10% share of the Seberang Perai residential property market. “We expect after the IPO, our market share will increase above 10%,” he added. To date, Tambun Indah has sold more than 2,800 residential units, mostly in mainland Penang with a GDV of more than RM800mil.” Teh said the group achieved commendable financial performance over the years and had maintained a low-borrowing financial model so as not to burden the balance sheet. As at Dec 31, 2009, the group was in net cash position. “Tambun Indah has adopted a progressive dividend policy of paying between 40% and 60% of group net profit to shareholders. “At an IPO price of 70 sen per share, the annualised net dividend yield is (about) 7% in financial year 2010,” he said. Two Malaysian actors plan to open a shopping mall within a park in October next year, said to be the first of its kind in Malaysia. Dubbed an outdoor living mart, the project will occupy a land area of 5.9ha located between Puchong, Seri Kembangan and Putrajaya. The project, dubbed "Garden Explore", will cover seven major zones of outdoor retailing lots, a plaza and entertainment hall, offices, cafes, restaurants and one petting zoo. "It's the first of its kind in Malaysia but there have been similar developments in China," said Jack Lim, a director of Green Atmosphere Sdn Bhd, at the launch in Kuala Lumpur yesterday. Managing director Nick JM Wong, a former actor, controls the firm while Weng Zheng Steel Bhd chairman Tan Ching Kee is the adviser. Construction work is due to start after the Chinese New Year next year. The company has not set any revenue target for the pioneer project. 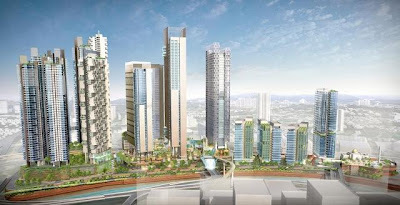 "The gross development value of the project is RM20 million and this does not include the land cost which was leased from Tempo Properties Sdn Bhd," Lim said. He declined to reveal the leasing cost, which runs for 10 years. A unique feature of the project is that cars will not be allowed into the area. Rather, visitors will have to walk or cycle their way through the mall. PETALING JAYA: Property firms IJM Land and MRCB have aborted their planned merger by way of a members' scheme of arrangement as both companies have not been able to come to an agreement. Separate announcements by both companies were made to the stock exchange on Friday concerning the matter. RHB Investment Bank and Newfields Advisors announced on behalf of MRCB that both companies “have not been able to reach an agreement on the definitive terms and conditions of the proposed merger”. Accordingly, they said the proposed merger was now aborted. Meanwhile, an IJM Land statement on Bursa Malaysia said after a series of discussions, both were not able to reach an agreement on the definitive terms of the proposed merger. REAL ESTATE and property developer, Ibraco Bhd, is selling a total number of 6.5ha of land in Kuching, Sarawak, to Wansa Realty Sdn Bhd for RM14.2 million. The demand for office buildings and exhibition buildings in the subject area is expected to be limited. The company told Bursa Malaysia Bhd that the disposal will avoid potential holding cost should Ibraco build and sell the office and exhibition buildings. The sale consideration is about 2.7 per cent above the market value of the land. PROPERTY developer Mitrajaya Holdings Bhd’s subsidiary has won a RM53.5 million contract for the construction and completion of five units of hangar, one unit of two-storey multipurpose café building, two units of electrical substation and one unit guardhouse at Subang Airport, Selangor. The contract awarded to Pembinaan Mitrajaya Sdn Bhd, is for a period of 10 months and work starts on January 1 2011. Axis Real Estate Investment Trust(Axis-REIT) is proposing to acquire a four-storey building, together with a freehold land, in Selangor from FSBM Holdings Bhd for RM51.25 million. The proposed acquisition would be consistent with the investment objective and would be accretive to Axis-REIT's distribution income, the company said in a filing to Bursa Malaysia today. It said the proposed acquisition would diversify and enlarge Axis-REIT's portfolio of properties and was expected to benefit the fund over the medium to long-term. 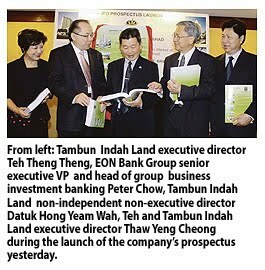 Tambun Indah Land Bhd, a leading property developer in Penang, is planning to acquire 3.2 hectares of land next year. Managing Director Ir Teh Kiak Seng said the group had identified 1.6 hectares on the mainland and another 1.6 hectares on Penang island with a gross development value (GDV) of approximately RM36 million and RM170 million, respectively. According to an independent market researcher, the residential property market in Penang was valued at RM3.7 billion last year, and the mainland accounted for approximately 30 per cent of Penang's residential property market. "Mainland Penang (Seberang Perai) is one of the fastest growing district in Penang due largely to a growing working class population as a result of rapid industrialisation," he said during the launch of the group's initial public offering (IPO) here today. Tambun Indah is scheduled for a main-market listing on January 18. "We are still eyeing for landbank in the Klang Valley like in Shah Alam and Kajang but are cautious about the cost, therefore, we have not finalised anything yet. "As we all know, Klang Valley is a good market to do housing, but we want to build our name by building quality homes at an affordable price. "We, however have no plans to expand overseas at the moment," Teh added. Last year, the group garnered a 10 per cent share of the Seberang Perai residential property market. "We expect after the IPO, our market share will increase above 10 per cent," he added. To date, Tambun Indah has sold more than 2,800 residential units mostly in mainland Penang with a GDV of more than RM800 million. Teh said the group achieved commendable financial performance over the years and had maintained a low-borrowing financial model so as not to burden the balance sheet. As at December 31, 2009, the group was in net cash position. "Tambun Indah has adopted a progressive dividend policy of paying between 40 and 60 per cent of group net profits to shareholders. "At an IPO price of 70 sen per share, the annualised net dividend yield is estimated to be approximately seven per cent in financial year 2010. "We believe this policy will go a long way in not only attracting investors but also ensuring value-creation for the long-term," he added. Tambun Indah's IPO consist of a public issue of 32 million new ordinary shares and an offer-for-sale of 22.1 million vendor shares at an IPO price of 70 sen per share. Of the 32 million new ordinary shares under the public issue, 11.05 million shares will be allocated for the Malaysian public. Meanwhile, it has also allocated 9.9 million shares for private placement and 11.05 million shares for eligible directors, employees and business associates of the group. The 22.1 million offer-for-sale shares will be allocated for placement to identified investors. Additionally, the group's IPO will raise RM22.4 million in proceeds for the group. Of this, RM12.70 million will be allocated for working capital, RM7.10 million for repayment of borrowings and the remaining RM2.60 million to defray listing expenses. MIMB Investment Bank Bhd is the adviser, sponsor, underwriter and placement agent for the group's IPO exercise. Green Atmosphere Sdn Bhd (GA) has estimated a gross development value of RM20 million for its newly launched one-stop outdoor living mart project called "Garden Explore". With its strategic location in Seri Kembangan, between Puchong and Putrajaya, the project would create opportunities for business owners in the industry with an expected high turnover of 750,000 visitors within a five km radius of the location, says GA's chief executive officer Nick Wong. "The project will begin after the Chinese New Year and we hope to complete it by October next year," he told reporters after the project's launch today. Wong, who is also the original concept creator of the project, added that Garden Explore has been strategically located to provide a better option for the public to meet their needs for outdoor accessories. GA has signed the lease agreement with the land owner, Tempo Properties Sdn Bhd (TP), for a period of 10 years and had also obtained the development order from the local authority to construct the project in August. TP's chief executive officer Khoo Boo Hian said the project would complement its adjacent development called The Atmosphere, which was a signature shop offices type commercial development between Tempo Properties and Eksons Corporation Bhd. "With the co-existence of Garden Explore and The Atmosphere, this part of Seri Kembangan will soon transform into a vibrant commercial hub," he said. He also said the project will be Malaysia's first outdoor living mart that would group all the resources and outlets within the green and landscape industry. The project will cover a total 14.5 acres of land consisting of seven major zones of outdoor retailing lots, a plaza and amphitheatre (entertainment hall), 30 contractors and designer or consultant offices, two cafes and restaurant. With a whole year round of events to be organised, the Garden Explore project is expected to offer various attractions to the public as well as business entities. Ibraco Bhd plans to dispose of 6.48 hectares of mixed zone land in Kuching, Sarawak to Wansa Realty Sdn Bhd for RM14.18 million cash. In a filing to Bursa Malaysia today, Ibraco said the demand for office and exhibition buildings was expected to be limited. "The disposal will avoid potential holding cost. In addition, the sale consideration is approximate 2.7 per cent above the market value of the land," it said. Ibraco said the disposal was expected to derive a gross profit of RM10.64 million for the year ending Dec 31, 2010. "It is expected to be completed within five years and the sale proceeds will be used for working capital," it said. ASIAN Pac Holdings Bhd’s unit, Safe Valley Sdn Bhd has signed a deal to sell 3.5ha of land in Setapak, Kuala Lumpur, to Axis Milestone Sdn Bhd for RM49.1 million. Proceeds will be used to reduce its borrowings and to fund other development projects. It expects to complete the deal by March 31 next year. PETALING JAYA: Sunway City Bhd is acquiring 64.63 acres near Johor Baru from Bukit Lenang Development Sdn Bhd for RM134.52mil. The company said in an announcement that a shareholders' agreement was also signed for a proposed joint venture via Asli Budimas Sdn Bhd (a subsidiary of Sunway City), for the development of the land. SINGAPORE: Singapore-listed developer GuocoLand, a firm linked to Malaysian billionaire Quek Leng Chan, said today it had no plans to set up a real estate investment trust (REIT), dismissing a report in the Business Times newspaper. GuocoLand rose as much as 2.7 per cent today after paper said it may float two real estate investment trusts with assets of up to S$8 billion (US$6.2 billion) in the next 3-5 years. “GuocoLand wishes to clarify that the group currently has no plans to establish a real estate investment trust,” it said in a filing to the Singapore Exchange. “The group will review this as a possible strategy to extract value from its property portfolio, at the appropriate time,” it added. The Sunway Pyramid shopping centre, which has been around since 1997, is still being continuously upgraded to keep up with the competition, says Sunway IFM Sdn Bhd retail division chief operating officer Kevin Tan Gar Peng. Due to demand for added space, we are expanding a section of our mall after Chinese New Year (which falls in early February), he says in an interview. The upgrade, says Tan, will comprise the addition of three levels of retail space. There will be another phase of expansion. Collectively, both phases will have a collective gross lettable area of 300,000 sq ft, Tan says, adding that it is too early to reveal the total investment cost for the upgrade. He says there is always room for improvement at the mall. The Sunway group has already invested some RM550mil in upgrades since the malls first inception. About RM30mil was spent to upgrade and improve the fly-overs and connecting roads around the shopping centre to improve accessibility to the mall, Tan says. Sunway Pyramid trumped all entries at this years FIABCI awards to become the Best Retail Development 2010. Of course, our goal is not to win awards. But winning it is a bonus and a testament to our hard work. Winning encourages us to work harder, says Tan. He says the mall spends about RM3mil annually to light up the surrounding area of the mall during festive seasons. According to Tan, the mall has been experiencing full take-up for the past seven years, with current rental rates at about RM10 per sq ft. This is in spite of the continuous expansion weve been making to the mall. Compared to other malls in the country, the Sunway Pyramid shopping centre has the advantage of being near a hotel and a theme park namely the Sunway Resort Hotel & Spa and Sunway Lagoon. Our strategic location provides a choice to people who come here, says Tan. Arab tourists who come with their families enjoy this option very much. The men like the facilities that the hotel offers. Their children love the rides at the theme park and their four wives can enjoy the shopping lifestyle, Tan enthuses. 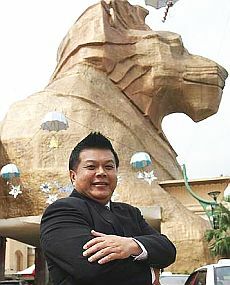 The appeal of the Sunway Pyramid shopping mall, especially to the Arabs, could also be because of its Egyptian-inspired pyramid and lion statue at the main entrance. Tan says the mall is the countrys first themed shopping and entertainment centre. We designed the mall in such a way that coming here would be more of an adventure than just a shopping trip. According to reports, property consultants expect 20 new malls with a combined net floor area of 4.4 million sq ft to be opened this year. According to statistics by the National Property Information Centre, as at March 2010, there were 49.98 million sq ft of existing retail space within the Klang Valley. A further 7.18 million sq ft is under development and 7.5 million sq ft of new space planned. Citing data from the Malaysian Association for Shopping and Highrise Complex Management, Tan says there are currently about 300 shopping malls in the country, with half of them in the Klang Valley alone. The competition (for malls) level in the Klang Valley is great. However (with the global economy picking up), tourist arrivals into the country have increased this year. That helps to support the malls. However, while the improved economic outlook has seen a tourist influx into the country, other countries, especially Singapore, have been luring Malaysian tourists to their malls, says Tan. Singapore is aggressively promoting their tourist destinations, such as Resorts World Sentosa, here. According to statistics from Singapores tourism board website, the number of Malaysian travellers into Singapore increased 40.2% to 95,371 for September 2010 from 68,008 in the previous corresponding period. For the nine-month period ended September, the number of Malaysian travellers rose 44.5% to 724,528. According to various reports, the surge in tourist arrivals into Singapore has been attributed to the opening of Resorts World Sentosa and Marina Bay Sands earlier in the year. Tan adds that with the advent of budget airlines, travelling has become cheaper. With cheaper flights now, more Malaysians are going abroad but that does not mean that the same amount of foreigners are coming in, he says, adding that local malls need to aggressively market their products or risk losing customers. Looking forward, Tan is optimistic about the local retail sector. He says that the Governments proposal under Budget 2011 to abolish import duty on 300 goods preferred by tourists is a good move. The move now makes branded goods more affordable. Now, shoppers dont have to travel overseas to buy such goods, he says. With the NKEA in mind, it is time to make GKL a livable place which is clean and peaceful, and filled with environment-friendly economic activities producing high-quality, high-value goods and services. MANY analysts compare, rather simplistically, the economy of Singapore with that of Malaysia. This is like comparing apples with oranges. The two economies cannot be compared in that simplistic manner because of the markedly different economic structure of two, with Malaysia having a large rural sector and abundant land, and Singapore, a service-oriented trading economy. It would be more meaningful to compare Singapore with Greater Kuala Lumpur (GKL), or what was often referred to as the Klang Valley. After all, the latter is already very urbanised and is endowed with modern infrastructure. The inclusion of GKL as one National Key Economic Area (NKEA) is befitting given that it is the epitome of our economic space and national urban system. In fact, we can take up issue with the physical and development planners of GKL if the region fails to perform socially, economically and culturally, on the scale achieved by city economies like Singapore and Hong Kong. The GKL region should be the leader in productivity and intellectual capital creation in various fields especially in services such as finance, education, communication and the arts, and high-value manufacturing where intellectual capital and K-economy-related activities are the natural choice. To date, the GKL has expanded much on the basis of organic growth. The processes of population concentration and agglomeration have led to what GKL is today. 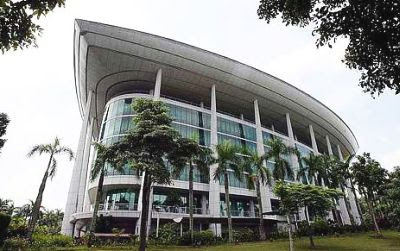 Its status as the national capital attracts many business houses to establish their headquarters in Kuala Lumpur, thus putting pressure on space and impacting property value. Thanks to earlier efforts, we have been able to avoid GKL from becoming a primate city, such as Manila, Mexico City, Bombay, and Cairo, with the attributes of over-population. Indeed, the earlier years of development concern for regional disparity restrained GKL from overexpansion and as such, growth was dispersed to other parts of the country, as expected by the spirit of federalism. In fact, on realising this, the seat of Federal Government administration was moved to Putrajaya, leaving Kuala Lumpur to become the financial and commercial centre of the country. In line with the NKEA objective, let us make GKL a livable place, clean and peaceful, and filled with economic activities which are environment-friendly yet producing high-quality, high-value goods and services. These activities will have a high content of intellectual capital. GKL does have the potential to attract high-return activities such as banking and finance, tourism, advertisement and professional services such as legal, accounting, engineering, healthcare and arts and design. The presence of premier tertiary educational institutions in and around GKL can help spur the growth of these activities in the area. The lower costs such as rentals of premises in the GKL compared with the rates in Singapore, Hong Kong and Bangkok can attract these services. In the same breath, GKL should not be the location of manufacturing activities which demand high-labour content and low technology. Other places where labour is still plentiful can be the location of such industries. This is one reason why regional corridors are established. The GKL, which covers various urban conurbations and the surrounding townships of Klang, Kajang, Bangi, Putrajaya, and Shah Alam, has to be targeted as a planned modern urban space and that its untoward features of squatters, traffic jams and unhygienic stalls have to be phased out or upgraded speedily to befit the region as the foremost urban centre of the nation. The transition has taken place, with Shah Alam, Bangi and Putrajaya leading the pack, but its momentum has to be expedited. The mindset of urbanites in GKL have to change fast to accommodate the emerging status of GKL. It is heartening to see that public transport has been given due emphasis in the National Key Result Area and the NKEA of the current administration. Indeed, the issue of traffic jams in the city of Kuala Lumpur, especially on Friday evenings and particularly when it rains, demands a strong political will to address as it is the consequence, in part, by our car ownership policy. On this matter, an independent transport and road planning body can be given the task to plan and carry out road and transport planning in the region, having regard for the current multiplicity of agencies with power to influence transport system in GKL. A final point that is worth reflecting is the position of Kampung Baru and Chow Kit in the context of future urban renewal expected to take place under the impetus of the NKEA of developing the GKL. The cultural and historical elements of urban planning have to be equally considered and there is no better window than capitalising on the opportunities arising from new developments of GKL, which has to grow with an identity of its own. The Securities Commision premises is a good example of a green building. WITH leading multinational corporations at the forefront to lease green office space, the demand for green buildings in Malaysia will continue to rise as environmental awareness grows and more companies embrace the practice of corporate social responsibility. Another driver is the growing body of evidence demonstrating that green buildings make financial sense. CB Richard Ellis (Malaysia) vice-president research, Nabeel Hussain says there is growing recognition that key participants in the countrys real estate sector have a responsibility to adopt sustainable building practices and related technologies in order to play a pro-active role in climate change mitigation. Malaysia has introduced its own green rating system, the Green Building Index (GBI) in 2009. The Government is supporting the drive towards green buildings and technology and its Budget 2010 was the first one ever to give priority to the procurement of goods and services that are environmentally friendly, he adds. Nabeel reveals that studies by CB Eichard Ellis on mature markets such as the United States and Australia have found that developing green buildings can help landlords achieve higher values, fetch higher rents and enjoy higher occupancy rates than comparable non-green buildings. In an ongoing study of national office portfolio in the United States managed by CB Richard Ellis, the company concludes that sustainable buildings are expected to generate stronger investment returns than traditionally-managed properties. The study found that owners of sustainably-managed buildings anticipate 4% higher return on investment than owners of traditionally-managed buildings, as well as 5% increase in building value. Roughly 79% of owners surveyed believe that sustainable properties perform well in attracting and retaining tenants, yielding a 5% increase in building occupancy and 1% increase in rental income, Nabeel says. This is the second phase of a multi-year study initiated in 2009 by CB Richard Ellis and the University of San Diegos Burnham-Moores Center for Real Estate. The largest and longest-running study of its kind, the ongoing analysis benchmarks and measures green building benefits and economic results as a framework of investment criteria for retrofit activity. increased productivity, 94% of tenant managers register higher employee satisfaction in green space and 83% of tenants believe their green space provides a healthier working environment. The study defined a green building as those with Leadership in Energy and Environmental Design (LEED) certification at any level or those that bear the EPA Energy Star label. All Energy Star buildings in the survey group had been awarded that label since 2008. Most of the buildings included in the research cohort had also adopted other sustainable practices like recycling, green cleaning and water conservation. CB Richard Ellis was recently ranked 30 among Newsweeks greenest companies in America, and occupied top spot in the financial services sector. The US Environmental Protection Agency has named CB Richard Ellis an Energy Star Partner of the Year for the past three years, including recent recognition for Sustained Excellence. Nabeel says the US Green Building Council has awarded CB Richard Ellis its Leadership Award for Organisational Excellence and the industry group, CoreNet, recognised CB Richard Ellis with a special commendation for Sustainable Leadership and Design Development. In Asia, CB Richard Ellis recently won a Merit Award for Interior Projects in an Existing Building at Hong Kong Green Building Councils 2010 Green Building Awards, in relation to its office relocation in Hong Kong. CB Richard Ellis new office premises in Hong Kong, Shanghai and Mumbai have been designed and constructed in accordance with LEED best practices. PETALING JAYA: Nusajaya Consolidated Sdn Bhd (NCSB), a 50:50 joint venture between UEM Land Bhd and United Malayan Land Bhd (UMLand), will develop 6.7 acres in Nusajaya, Johor, into a mixed development project with a gross development value of RM670mil. UMLand said in a statement to Bursa Malaysia that NCSB yesterday signed an agreement with Bandar Nusajaya Development Sdn Bhd to acquire the freehold land in Nusajaya for RM49.6mil in cash. The proposed development, to comprise commercial, residential and retail components, will be developed over four years and is expected to yield a gross profit of RM160mil. It is located in Puteri Harbour, an integrated waterfront and marina development spanning 278.42ha within Nusajaya and Iskandar Malaysia. At present, NCSB is developing boutique waterfront apartments in Puteri Harbour scheduled for launch next year. Following the purchase of 0.89ha in November 2009, NCSB has now exercised its option to buy the second parcel. UMLand said the land and development costs would be financed through internally generated funds and/or bank borrowings. UEM Land Bhd, the master developer of Nusajaya, signed a sale and purchase agreement valued at RM49.6 million with Nusajaya Consolidated Sdn Bhd, as the latter has exercised its option to buy a second parcel, measuring 2.71ha in Puteri Harbour. Nusajaya Consolidated, a 50:50 joint venture company of UEM Land and United Malayan Land Bhd, was formed in October 2008 to develop waterfront properties in Puteri Harbour. It purchased a 0.89ha land in November last year, with the option to purchase a second parcel. Nusajaya Consolidated is currently developing boutique waterfront apartments, scheduled to be launched in 2011. United Malayan Land Bhd (UM land), a property developer, gained 1.2 per cent to RM1.76, set for its highest close since November 24. The company said its joint venture, Nusajaya Consolidated Sdn Bhd, has exercised an option to buy a 6.7-acre land in Puteri Harbour in Johor state for RM49.6 million. The joint venture plans an office, residential and retail project on the land worth RM670 million in gross development value, according to a company statement. CapitaMalls Asia Ltd is buying Queensbay Mall in Penang for about RM658 million. The acquisition will be made through CapitaMalls Asia's subsidiaries and an asset-backed securitisation structure. CapitaMalls Asia will buy about 90.7 per cent of the mall's retail strata area and all its car park spaces, the company said in a statement yesterday. Queensbay Mall is Penang's largest mall located at Bayan Lepas along the southeastern shorefront of Penang island and about 20 minutes' drive from Penang International Airport. It is a family-lifestyle mall located at the heart of a 29.57ha prime waterfront integrated development which comprises a hotel, a wide range of residential homes and planned office towers. It is easily accessible from the north of the island via the Jelutong Expressway and from the south via the Bayan Lepas Expressway. This will be CapitaMalls Asia's second mall in Penang and fourth in Malaysia. The other three malls - Gurney Plaza in Penang, an interest in Sungei Wang Plaza in Kuala Lumpur and The Mines in Selangor - are owned through CapitaMalls Asia's stake in CapitaMalls Malaysia Trust. "Gurney Plaza, which we already own through CapitaMalls Malaysia Trust, and Queensbay Mall are the two best malls in Penang. "The acquisition of Queensbay Mall, the largest shopping mall in Penang, will substantially strengthen CapitaMalls Asia's market leadership in the state. "This acquisition signals our ongoing commitment to invest in Malaysia's retail sector for the long-term, following our listing of CapitaMalls Malaysia Trust in July this year," CapitaMalls Asia chief executive officer Lim Beng Chee said in the statement. Nusajaya master developer UEM Land Bhd has signed a sale and purchase (S&P) agreement valued at RM49.6 million with Nusajaya Consolidated Sdn Bhd (NCSB). NCSB is a 50:50 joint venture company of UEM Land and United Malayan Land (UM Land). "Following the purchase of 2.204 acres in November 2009, NCSB has now exercised its option to purchase a second parcel, measuring 6.698 acres in Puteri Harbour. "The acquisition was pursuant to the exercise of the option given to NCSB to purchase Parcel Commercial South 3 (Parcel CS3) at Puteri Harbour," UEM Land said in a statement today. Parcel CS3 is located within the Commercial South development of Puteri Harbour. UEM Land managing director and chief executive officer Datuk Wan Abdullah Wan Ibrahim said the exercise of the option and the S&P agreement reaffirmed UM Land's commitment and belief towards the overall development potential of Puteri Harbour. "With UM Land's involvement in the development, it will contribute to realising our vision to develop Puteri Harbour as a premier waterfront destination for the region," he said. KUALA LUMPUR: UEM Land Bhd and UNITED MALAYAN LAND BHD (UMLand) are teaming up to develop the second mixed development project in Puteri Harbour with an estimated gross development value of RM670 million while gross development profit is estimated at RM160 million. UEM Land, the master developer of Nusajaya, had on Thursday, Dec 23 signed a sale and purchase agreement valued at RM49.6 million with Nusajaya Consolidated Sdn Bhd (NCSB), a 50:50 JV of UEM Land and UMLand to acquire the parcel of land -- Parcel Commercial South 3 (Parcel CS3) -- in Puteri Harbour. The Parcel CS3 is within the Commercial South development of Puteri Harbour. Commercial South is envisioned to be a business and residential hub with high towers overlooking the marinas of Puteri Harbour. UEM Land and UMLand said their strategy was to target regional companies to locate their offices there while for the condominiums, their plan was to attract international investors to be the main buyers for the units. UEM Land managing director Datuk Wan Abdullah Wan Ibrahim said the company was excited with the exercise of the option and the SPA as it reaffirmed UMLand’s commitment in the overall development potential of Puteri Harbour. “We have enjoyed a strong working relationship with UMLand in the development of Parcel A3 and are pleased with the progress achieved for Parcel A3, which we hope to introduce to the market in 2011. “With UMLand’s involvement in the development, it will contribute to realising our vision to develop Puteri Harbour as a premier waterfront destination for the region,” Wan Abdullah said. Presently, NCSB is developing boutique waterfront apartments scheduled to be launched in 2011. UMLand group chief executive officer Pee Tong Lim said with development activities picking up in Nusajaya, the joint project was timely and augured well with UMLand’s business plans and strategies. 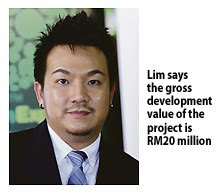 “This development is expected to contribute to UMLand’s group earnings from financial year 2012 onwards,” said Pee. PETALING JAYA: Land & General Bhd (L&G) plans to develop an upscale residential development with estimated gross development value of RM555mil in Seremban. L&G told Bursa Malaysia that its wholly-owned subsidiary Bright Term Sdn Bhd had signed a conditional agreement to acquire 10 parcels of land in Seremban with a 27-hole golf course for RM25mil. The properties, located in the Tuanku Jaafar Golf & Country Resort, would be developed to include bungalow lots, double-storey cluster semi-detached houses, link cluster houses and apartments, L&G said. It expects gross development profit of RM135.52mil, excluding land cost. The proposed development, to be completed in 2018, will be financed through internally generated funds and borrowings. The yields of Malaysian Real Estate Investment Trusts (REITS) are expected to come down next year in view of the surplus in office buildings with the completion of new projects. The yield, which is also known as return on investment in properties, is derived by dividing rental with property value. President of the Association of Valuers, Property Managers, Estate Agents and Property Consultants in the Private Sector, Malaysia, Choy Yue Kwong, said while the surplus in office buildings is expected if more developers receive the nod to build, there are very few premium-grade 'A' buildings. "Investment-grade buildings with premium values are the ones foreigners are looking for," Choy said in an interview. Choy said while there are enough of good properties in Kuala Lumpur, not many of them are for sale. "Some of them are owned by banks and most of them do not have the incentives to sell," he said. He said the owners, some of them big corporates like Boustead Holdings Bhd and its major shareholder, Armed Forces Fund Board, own a lot of properties but may not be motivated to sell them as they are in the business of investing in properties and collecting rentals to pay dividend to members. However, Choy said, there are rare instances when corporates or REITs will sell. In March this year, Pelaburan Hartanah Nasional Bhd, manager of Amanah Harta Tanah PNB (AHP) sold three parcels of land in Pahang, Perlis and Kedah, together with shopoffice units erected on the parcels, to Permodalan Nasional Bhd for RM2.01 million. The proceeds from the disposal were used to part-finance the cost of upgrading and refurbishment of Plaza VADS in Taman Tun Dr Ismail, Kuala Lumpur, another property owned by AHP, a REIT. Choy said that while investment-grade properties are most sought-after, there is no need to buy expensive properties, or Grade A buildings, to get a reasonable yield of seven per cent. "For instance, you can buy a property in Cyberjaya and still get a reasonable yield. "It is also important that buildings are rebranded to upmarket category," he said. He said one of the well-known office and commercial buildings in KL which has been extensively re-branded to upmarket brand is the Intermark, which is located at the junction of Jalan Tun Razak and Jalan Ampang. It sets new standards in design and quality by integrating green technology and a lifestyle environment for work and leisure. The project, which consists of Grade A office towers, an international hotel and retail podium, was a refurbishment of several buildings -- City Square, Empire Tower, Plaza Ampang and Crown Princess Hotel. Choy said market rate of office space for premium Grade A office buildings in Kuala Lumpur is expected to be stable next year with market rate of between RM5 and RM7 per sq ft. The Federal Government is to make Penang the preferred hub in the region, Prime Minister Datuk Seri Najib Tun Razak said Monday. He said several development strategies designed to stimulate the state's economy and provide jobs were driving the federal government towards that goal. The development in Penang would result in encouraging economic growth in the national interest, he said at the ground-breaking for an extension project at the Bayan Lepas International Airport here. Penang Chief Minister Lim Guan Eng was present at the ceremony. Najib said 10 infrastructure projects had been identified for implementation, and they included the expansion of the airport, Penang Port and the Penang Bridge, construction of the second bridge and the creation of a multimedia super corridor in the state. "These initiatives will not only facilitate economic activities but also support our nation's objective to increase tourism revenue from the RM53 billion in 2009 to RM168 billion by 2020," he said. Najib said Penang had many unique advantages which positioned the state well to become a hub for the northern corridor and the growth triangle comprising Indonesia, Malaysia and Thailand. "For example, Penang already offers the highest economic density and the shortest distance to market for a city in the growth triangle," he said. The total development of the airport expansion project, targeted to be completed by 2012, costs RM250 million, which is provided for under the RM60-billion fiscal stimulus package announced by the federal government last year. Najib said the project was yet another federal government initiative to enhance facilities and services as Penang was a catalyst for growth of the tourism industry. From the commercial perspective, airports enjoyed a competitive advantage and a captive market and, today, the modern airport offered much more than just a place to catch a flight, he said. He said that following the example of successful airline hubs around the world, Malaysia envisioned its airports as a platform to drive commercial business. In today's interconnected world, the abilities to offer high quality reliable air travel services and facilities served as a catalyst to attract trade and investment into any country, he said, adding that this directly supported employment and wealth generation which in turn would help Malaysia's drive to become a high-income nation. Najib said the Penang international airport had seen encouraging traffic growth, receiving more than 3.4 million passengers this year up to September, up by 30.5 per cent from the corresponding period last year. "As such, I am sure the expansion of the airport will enable Penang to achieve greater economic growth," he said. Despite the gloomy economic outlook on the global front, the local property market is expected to be positive and on the upswing for next year and 2012, the Association of Valuers, Property Managers, Estate Agents and Property Consultants in the Private Sector Malaysia (PEPS) organising chairman Eric Ooi said. However, there were certain market segments within the property sector that may be lagging behind, he says. Ooi says the Malaysian economy has bounced back, the stock exchange is reaching new highs, an indication that the stimulus packages introduced by the government after the global financial crisis is working. On the different property segments, he says landed properties in prime locations have skyrocketed, especially in the Klang Valley, and the retail property segment remains fairly strong. Eric Ooi fielding questions from reporters, while PEPS president Choy Yue Kwong is on the left. However, the office sector is still soft but showing signs of improvement, as is the industrial sector, he says. Ooi also says there is a need to ensure greater balanced growth in all sectors of the property market and this requires government support as well as incentives for the developers to participate in such property developments. He cites affordable homes to the masses and young couples setting homes as a segment of the property market that need further support from the Government. However, Ooi concedes that affordable homes in the residential sector, especially in the Klang Valley and in prime locations in other states are possibly going beyond the affordability of this young group of people, based on their general income levels as studies show the average homes in the Klang Valley cost from RM400,000 to RM450,000. On the value of Malaysian properties, Ooi says there was a time not too long ago when Malaysian properties were undervalued. But now we believe the properties are generally fairly valued based on our estimates. Malaysian properties generally have a trend of steady and stable growth over the years, unlike some other developing countries in the region where property prices can spike considerably in a matter of a few years, he says. On high-end properties, he says there is currently a good balance of locals as well as foreigners buying these properties, which are generally worth RM1mil and above. We are also seeing many high net-worth foreigners showing interest in properties in Asia and some have chosen to purchase properties in Malaysia, despite the lower yield, compared with, say, Vietnam. These foreign buyers may not be looking at high yield, which normally comes with higher risk, opting for properties with stable growth such as those in Malaysia and Singapore. As a rule, Malaysian properties generally double up in their value over a ten-year period, but there are exceptions, especially in strategic locations in the Golden Triangle, he says. The 4th Malaysian Property Summit 2011 will be held on Jan 18 at the Sime Darby Convention Centre in Bukit Kiara, Kuala Lumpur. Organised by PEPS, it will focus on property trends, movements in rents and prices, demand and supply and forecasts for the various property segments of the property market. We expect over 200 participants from the property sector such as developers, property owners, investors, fund managers and bankers as well as property analysts, economists and property consultants present at the this property summit, Ooi says. Property consultancy Savills Rahim & Co executive chairman and founder Datuk Abdul Rahim Rahman says he is optimistic about next year, particularly the second half of 2011. The Government has announced various mega projects. This will have a spillover effect. But you cannot expect to see the cranes immediately. That will come later. The land (for the various projects) has been identified. As for the development of Kampong Bharu, the bill has been tabled for first reading. So the corporation to see to that development will be set up some time next year, says Abdul Rahim. Much of the economic growth will be driven by the services and manufacturing sectors and this will have a positive effect on the property sector. Nevertheless, Abdul Rahim cautions that there must be adequate studies done on demand and supply today and in the future for office space. There are 6 million sq ft of office space in Kuala Lumpur under construction today. This will be ready by 2012, excluding those announced and being planned by the government this year. It is prudent to do more detailed feasibility studies on demand and needs, with some consideration given to what is happening in US and Europe today, and if there is a need to postpone some of these projects, let's do so. Nonetheless, Abdul Rahim says he supports the high value, high impact projects because they will help to push the country into the high-income bracket model that the government is envisioning. But do not do it at the expense of a glut, he says. In all likelihood, if the government goes ahead with the planned projects, there will be 10 million sq ft of office space on the cards entering the market in years to come. The city of Kuala Lumpur can only absorb 1.5 million sq ft of office space. This has been the trend for the last three years. That means, next year and 2012, we can only absorb 3 million, and we have 6 million sq ft coming on stream in 2012, excluding the office space that will be made available in the several high-impact projects announced this year. MALAYSIA is 53 years old this year. More than 20 years ago in the 1980s, a group of Penans from Sarawak, wearing only flimsy loin cloths and feathered head gear, flew into Kuala Lumpur to protest against the deforestation. The opening up of the interiors resulted in environmental degradation, clogging rivers and cutting off their source of food and clean water supply. They contented that the forest was their home, ancestral grounds, source of livelihood, that they have native customary land rights'' to the forest. Remember the movie Avatar? Fast forward to 1990s, a decade later. Initial plans to build the Bakun hydroelectric dam in Sarawak created another hue and cry among natives. Thousands of Kayans and Kenyahs were displaced. The 67,000ha reservoir, about the size of Singapore, is being flooded right now, after much delay in its construction. Enter the present. Early this week, the Kampong Baru Development Corp Bill was tabled for its first reading. It will go through the usual process for debate in the lower house of Parliament and in Senate, the upper house. That Bill paves the way for the setting up of a corporation to implement the development of Kampong Baru (literally translated new village), a Malay reserve enclave that goes back to British India days in the late 19th century. Covering about 380 acres amid the progress and modernity of the city, the village is a rustic world of timber and concrete housing, with chickens running helter skelter admist the gleaming Petronas Twin Towers. In Kampong Baru, traditions still reign supreme. For years, the different administrations have tried to bring development to the land owners there ar 4,300 lot owners only to face a palette of issues, from legal to political to racial. It is the hotbed of Malay sentiments. What has the natives of Sarawak laying claim to the forest got to do with the Malays laying claim to Kampong Baru? First, they are all Malaysians, known singularly as bumiputras, or sons of the soil. Secondly, they want their land rights to be protected. Land ownership is a funny thing. It stirs up much sentiment within each of us, no matter what tribe we may hail from. Although we may lay claim to modernity and display elements of it, in many ways, if we examine the roots of our being, each of the race that make up this country is tribal. And each of us have a legacy we want to protect and pass on to future generations. Legacy goes beyond land ownership, or wealth but has much to do with it. Legacy also includes values, knowledge, experiences that are passed down from generation to generation. These are the intangibles that must be considered as assets, as much as the tangibles like land and houses. Legacy should not just denotes the past. It includes the present and future because mankind is made in such a way that they enter this world with the desire to leave something for future generations. Herein lies the need for strong leadership because how a family or a country is governed has a strong influence on the future. The core issue of Kampong Baru development will be its Malay land rights, just as the natives of Sarawak demand their native customary rights, just as everybody in this country desire his right to live, work and prosper in this country, unquestioned. The number of hotels, office blocks, residential houses or condominiums, roads and healthcare are important, but when laid side-by-side with the issue of the legacy of the Malay community of Kampong Baru, the future architectural landscape seems peripheral. Kampong Baru is among several mega property projects to be undertaken by the government but it is probably, by far, one that may potentially be the most contentious because of this issue of legacy and land rights. Let's have consensus, not directives. Assistant news editor Thean Lee Cheng is all for development, but don't leave out the soul of that development. PETALING JAYA: IJM Corp Bhd said its wholly-owned unit received a contract worth RM460.59mil from Naza TTDI Construction Sdn Bhd for superstructure works for the latter’s development in Kuala Lumpur. It told Bursa Malaysia yesterday that IJM Construction Sdn Bhd received the work contract acceptance letter on Dec 16 for the execution and completion of superstructure works for the Platinum Park Phase 3 along Jalan Stonor. Phase three includes the proposed development of two office tower blocks of 50 and 38 levels, comprising one facilities area, eight levels of podium carpark and three levels of basement carpark. The completion date for this project is Dec 31, 2013. Platinum Park is an integrated high-end residential and commercial development. It will see seven towers, namely two super condominium towers, a serviced apartment, a five-star hotel and three Grade A office towers. KPJ Healthcare Bhd is set to raise RM138.7 million by injecting three of its hospital buildings into a real estate investment trust (REIT) scheme called Al-'Aqar KPJ REIT. 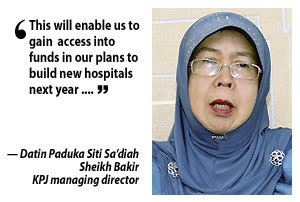 KPJ managing director Datin Paduka Siti Sa'diah Sheikh Bakir said under the scheme, the healthcare group will in return get a combination of RM1.1 million in cash and the balance in new Al-'Aqar KPJ REIT units. The exercise involves the sale of two hospital buildings here - the Bandar Baru Klang Specialist Hospital in Selangor and the Kluang Utama Specialist Hospital in Johor. The third hospital is the Rumah Sakit Bumi Serpong Damai building in Jakarta, Indonesia. To retain the use of the buildings, the group in turn will rent the buildings via a 15-year lease with an option to extend the tenure for another 15 years. The asset injection will allow the group to unlock value and realise its investment in the properties, Siti Sa'adiah said. Proceeds from the asset sales will be used to pare down the group's borrowings and trim the gearing to 0.4 times from 0.5 times and an interest cost-savings of about RM2.2 million a year. "This will enable us to gain access into funds in our plans to build new hospitals next year such as in Pasir Gudang, Kuantan, Klang, Muar and in Sabah," she told reporters in Kuala Lumpur yesterday after Al-'Aqar KPJ REIT's annual shareholder meeting. Al-'Aqar KPJ REIT is the first and largest Islamic healthcare REIT in Malaysia and managed by Damansara REIT managers Sdn Bhd, which is a member of the Johor Corp Group (JCorp). The sale and leaseback of the three hospitals is the fourth tranche of the REIT's injection since its launch in 2006. The first tranche involved the injection of six hospital buildings valued at RM481.2 million, the second involved the sale of five buildings for RM170.0 million and the third comprised seven hospital buildings and one nursing college for RM292.5 million. With the injection, Al-'Aqar KPJ REIT's total enlarged units stands at 636.8 million units with a total of 22 hospital buildings under its scheme, one nursing college, the Selesa Hotel, Metropolis Tower and another two properties in Jakarta. Upon completion of the proposed acquisitions, the enlarged total asset value will be more than RM1.2 billion. Al-'Aqar KPJ REIT will seek listing and quotation for its consideration units of 56.6 million units on the Main Board of Bursa Securities. The implementation of the mass rapid transit (MRT) project in the Klang Valley is expected to generate a Gross National Income (GNI) of between RM3 billion and RM4 billion beginning next year until 2020, said Prime Minister Datuk Seri Najib Tun Razak. He said between RM8 billion and RM12 billion was expected to be generated in terms of spinoffs from the construction of the MRT project. "RM21 billion in GNI incremental impact is anticipated to be generated in 2020 from the value appreciation of the project and increase in productivity rate," Najib told a press conference at the Royal Malaysian Air Force base in Subang before his departure to Kuala Terengganu for a one-day official visit. The Prime Minister said the Cabinet had approved the implementation of the MRT project at its weekly meeting on Friday. The MRT, the largest infrastructure project in Malaysia, is an economic entry point project identified for the Greater Kuala Lumpur/Klang Valley National Key Economic Area under the Economic Transformation Programme. Najib also said the MRT project would generate 130,000 jobs during the duration of its construction which was expected to commence July next year and be complete in five to six years. Once operational, the MRT will first ply the Sungai Buloh to Kajang route via the Kuala Lumpur city centre. "The travel distance is about 60km and 35 MRT stations will be built along that route. Integrated stations would be built in locations where the MRT overlaps KTM Commuter, Kelana Jaya and Ampang Light Rail Transit (LRT) routes," he explained. The Sungai Buloh-Kajang MRT will provide efficient train service to 1.2 million people, he said, adding that it would serve densely populated Kota Damansara, Mutiara Damansara, Bandar Utama, Taman Tun Dr Ismail, Bukit Damansara, Cheras, Bandar Tun Hussein Onn and Balakong. Najib also said more than 400,000 commuters would benefit from the Sungai Buloh-Kajang MRT service daily. The routes and locations for the MRT have yet to be finalised and value management studies would be conducted taking into account the optimum utilisation rate and maximum real estate realisation value. As such, he said the actual project cost can only be determined once the value management studies are completed. "The entire cost of building the project is being fine-tuned. Initial estimates made in 2009 placed the figure at about RM36 billion but this was subject to changes," Najib said. The Prime Minister said the final cost of the project would depend on factors such as the awarding of contracts through open tender, the escalating cost of raw materials and others. The Prime Minister also added the government decided on kicking off the project with the Sungai Buloh-Kajang route as this corridor did not have adequate rail transport service. Indepth studies were also carried out on this route which was proposed by Syarikat Prasarana Negara Bhd in 2008 and by MMC-Gamuda Joint Venture Sdn Bhd recently. The Sungai Buloh-Kajang MRT will built under phase one of the MRT network in the Klang Valley. Future routes to be developed gradually over several stages have been proposed and is being studied under the Urban Public Transportation Masterplan, he said. Asked if any new entry points projects would be unveiled, Najib said several projects would be announced in January. PROPERTY developer YTL Land and Development Bhd will launch its iconic condominium, "The Capers" in Sentul East in the first quarter of 2011, its customer relation's manager, Karen Tan, said. The stunning architectural icon comprising two 36-storey towers interrupted at random with sky gardens and flanked by two five-storey low-rise duplex townhouses, will definitively be a statement of loft living, she said. However, she could not divulge the project's gross development value as it was still being assessed but added that the iconic condonomium was set to change the face of the 100-year old former railway town that was now a draw for the young modern crowd. Two other condominiums in the area, built by YTL Land, are "The Tamarind" and "The Saffron", completed in 2005 and 2008, respectvely. A total of 5,000 buyers have expressed thier earnest enthusiam by registering for units in the project, she told a press conference to announce the completion of the first office project in Sentul West and Sentul East, called "d7". "d7", is a seven-storey architecture and cutting edge duplex sky office, located on prime land, which boosts of boutique offices, retail, food and beverage outlets encased in a lush landscaped courtyard atrium area. Karen said "d7", which was completely sold out, had appreciated by more than 40 per cent since its debut in September 2007. The launch price for "d7" then was RM380 per square feet and today it is valued at RM650 per square feet. "d7" will soon be connected to "d6" via a sky bridge stretched over Jalan Sentul and the elevated Sentul Skywalk will connect all of Sentul East developments in the future to provide convenience to the community. PETALING JAYA: Mulpha International Bhd will use the RM327mil proceeds from the sale of its Hilton Melbourne Airport Hotel to repay its debt levels unless new investment opportunities arise. Executive chairman Lee Seng Huang, in an e-mail reply to questions from StarBiz, explained: While we have no current use of the proceeds, we will repay our outstanding facilities as much as possible. But if and when an opportunity comes up, we can redraw our loan facilities to make an acquisition. This is part of our treasury management to ensure we maximise returns on our cash resources. In a statement to Bursa Malaysia yesterday, Mulpha said that the proceeds, if used to repay debts, could bring down the group's debt levels from RM1.5bil to RM1.18bil. To recap, yesterday Mulpha said it's wholly-owned subsidiary Mulpha Australia Ltd, had sold the Hilton Melbourne Airport Hotel to Singapore-listed Pan Pacific Hotels Group for A$108.89 (RM337.5mil) cash, with the sale expected to be completed by the first quarter of next year. Mulpha said the hotel was acquired in June 2004 at a cost of A$40mil (RM120mil) as part of a larger acquisition of a portfolio of properties. The disposal of Hilton Melbourne Airport Hotel crystalises the embedded asset value in this investment which has significantly appreciated in value since the acquisition in 2004. During this time, the hotel performed exceptionally well and has won numerous awards. The sale will result in a one-off pre-tax gain of A$77mil (RM238.6mil) for the group, Lee said in a statement. The Hilton Melbourne Airport Hotel is a six-level, four-and-a-half star hotel comprising 276 rooms on a 6,630 sq m land. Mulpha other assets in Australia include the five-star InterContinental Sydney, a resort-styled property development called Sanctuary Cove in northern Gold Coast and Hayman, a five-star private island destination on the Great Barrier Reef. Mulpha also owns 25% of Australian-listed FKP Property Group, the largest private owner/operator of retirement villages in Australia and New Zealand. All these assets were acquired by Mulpha Australia between 2002 and 2004. FKP and Mupha were recently in the news in Australia over rumours that the former's second-largest shareholder, Stockland a leading Australian property developer was seeking to take over FKP. Lee had then said that Mulpha was not keen on selling its shares in FKP as there was still a lot of upside potential in it. In an earlier interview with StarBiz, Lee also said that Mulpha was inclined to reinvest its profits. Mulpha's investment philosophy is to maximise the value of its assets and recycle that money into other assets that can generate more value,'' Lee said. FOREIGN interest in high-end condominiums in Kuala Lumpur will accelerate next year with the impact from Economic Transformation Programme's Greater Kuala Lumpur plan, property market players said. The economic crisis in the past two years had seen a dip in foreign interest leading to a 30 per cent drop in prices. "Going forward, we expect a return in buyer interest from Singapore, Hong Kong, Indonesia and more recently from the Middle East," said Eric Y.H. Ooi, organising chairman of the forthcoming Fourth Malaysian Property Summit at a briefing yesterday. Prices of these high-end units in the city centre, ranging from RM1 million and RM2 million, have caught up with previous peak levels. Foreign ownership to local ownership, which was at 30:70 per cent ratio, is expected to increase. "Come 2011 we will be able to see whether foreign interest will be better than the past two years or to the peak in 2007/2008 when it was 50:50 per cent ratio," Ooi said, adding that there had been drop in interest from European investors. Ooi, who is also managing director of Knight Frank Malaysia, described the Malaysian property market scene as probably one of the most attractive in the region with fewer number of ownership restrictions. Foreign investors are attracted to the higher yield from these high rise investments at 5 per cent compared to landed properties, which provide between 2 to 3 per cent yield. He said it would be interesting to see the property market scene when the second-tier Chinese investors from the mainland are allowed to purchase overseas properties. Already there has been a spike of Chinese interest in properties elsewhere in Australia and Singapore. Past president of the Association of Valuers, Property Managers, Estate Agents and Property Consultants in the Private Sector Malaysia James Wong expects the inflow of foreign buyers to increase in 2012 with the implementation of the ETP. "With the Greater KL and billions of ringgit in the MRT (mass rail transit) and LRT projects, we can expect to see an influx of expatriate population as seen during the last boom when the Petronas Twin Towers was taking shape," Wong said. He added that unlike China and Singapore, Malaysia is not expected to see property asset bubble in the foreseeable future. Wong also expects non-performing loans ratio (NPLs) to go up in the first quarter of 2011 although not at alarming rates. He attributed it to the 5 to 10 per cent easy down payment scheme to purchase properties. The Fourth Malaysian Property Summit organised by PEPS will be held at the Sime Darby Convention Centre in Kuala Lumpur on January 18. It will have an overview of the property market performance and outlook for the office market, retail market, industrial market, high end condominium and REITs. PEPS president Choy Yue Kwong said the property summit is also relevant to those who wonder whether it is the right time to sell their properties for alternative investments or right time to buy or invest or do nothing and wait for property prices to appreciate further. 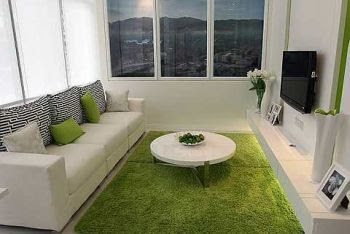 Green living: The sitting room in the studio showhouse unit of VUE Residences Serviced Suites. If you are looking for an abode that offers chic lifestyle amid tall skyscrapers, then look no further than the VUE Residences Serviced Suites located along Jalan Pahang, Kuala Lumpur. Developed by Prinsiptek Corporation Berhad (PCB), the freehold project comprises 23-storey with a roof garden/sky garden on the 24th floor. The first to seventh floors are multi-level carparks where residents are entitled to a parking bay per unit. There are 340 car park bays. PCB group managing director Datuk Foo Chu Jong said the project is surrounded by various prominent landmarks like the Suria KLCC, Pavilion Shopping Centre, Titiwangsa Lake Garden, KPJ Tawakal Specialist Centre, Prince Court Medical centre, Istanan Budaya, and the National Art Gallery and it just five minutes away from the Chow Kit monorail station and Titiwangsa LRT station. With 72 units, every floor has a combination of four models ranging from 500 sqft studio units to the bigger two-roomed units and the 1003 sqft three-roomed units. “There is an indoor lap pool, gymnasium and a 24-hour security to give residents a peace of mind” added Foo. Prices range from RM370,000 to RM772,000 and the project is expected to be completed by Dec 2013. PCB’s other notable projects are The Prince in Bangkok, Section 8 Bandar Baru Bangi, Serdang Perdana Sky Villas, Ampang Prima Condominium and Section 7 Shah Alam. 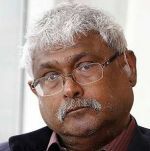 KUALA LUMPUR: There should be a national housing policy for affordable homes, said Datuk Mani Usilappan, who is council member the Association of Valuers, Property Managers, Estate Agents and Property Consultants in the Private Sector Malaysia (PEPS). He said it was timely that such a policy be implemented to ensure homes remain affordable to the mainstream home buyers. Mani, who is also advisor to PEPS organising committee, said housing, especially in prime locations, were becoming too costly for average income earners. There is need for the Government to implement a national housing policy, particularly for this group of people who represent the bulk of Malaysians, he said at a media briefing on the 4th Malaysian Property Summit 2011 yesterday. Mani said perhaps the national housing policy could include the different categories of the property market, including the affluent segment. It is difficult for property developers to resolve this issue (affordable homes for the masses) by themselves, he said. PEPS organising chairman Eric Ooi concurred with Mani, adding that while the overall outlook of the Malaysian property sector is positive, there is a need to ensure affordable housing is available to mainstream home buyers. He acknowledged there was a growing number of young people (35 years and below) and young couples who were finding it difficult to own a home. Studies show the average home in the Klang Valley costs about RM400,000, so it would be quite impossible for these people to own one, he said. On foreigners snapping up these homes, Ooi said it was more a perception than reality as the majority of foreigners tended to buy residential properties in prime locations that can cost RM1mil or more. We don't see this as an issue, he said, noting that the Government had plans to raise the income levels of Malaysians over time by improving productivity. PEPS past president James Wong said the Government had a significant role to play to ensure affordable housing was available to the masses. The authorities have to ensure land and funds are available for such housing projects and developers are give sufficient incentives to build these homes, he said. The 4th Malaysian Property Summit 2011 will be held on Jan 18 at the Sime Darby Convention Centre. Al-'Aqar KPJ REIT, the first and largest Islamic Healthcare REIT in Malaysia, has got the nod from its shareholders for proposed acquisitions at its Extraordinary General Meeting (EGM) today. Al-'Aqar KPJ REIT has proposed to acquire the entire interest in Bandar Baru Klang Specialist Hospital Building in Klang, Kluang Utama Specialist Hospital Building, Kluang, Johor and Rumah Sakit Bumi Serpong Damai Building in Jakarta, Indonesia, from the subsidiaries of KPJ Healthcare Bhd. This is in addition to the Rumah Sakit Medika Permata Hijau Building in Jakarta, Indonesia, from PT Khidmat Perawatan Jasa Medika, a subsidiary of Johor Corporation. In a statement here today, the company said it has proposed to acquire the above properties for a total cash consideration of RM159.910 million to be satisfied partly by RM104.402 million cash and partly by the issuance of 56,641,000 new units in Al-'Aqar KPJ REIT at an issue price of RM0.98 per unit. Al-'Aqar KPJ REIT will seek listing of and quotation for its consideration units of 56,641,000 on the Main Board of Bursa Securities. It said this will bring the total enlarged unit capital of the Al-'Aqar KPJ REIT after the proposed acquisitions to 636,808,000 units and also from the existing 18 hospital to 22 hospital buildings, one nursing college and also the Selesa Hotel and Metropolis Tower. It also brings the total number of properties to 24 - 22 in Malaysia and two in Jakarta. The proposed acquisition is expected to be accretive to Al-'Aqar KPJ REIT''s distributable income going forward. Upon completion of the proposed acquisitions, the enlarged total asset value will be approximately more than RM1.2 billion. 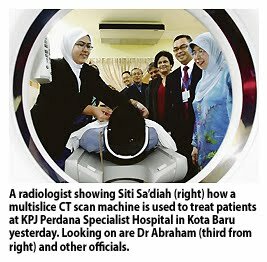 S P Setia Berhad recently announced that it targets to achieve RM3 billion sales in FY2011. This is on the back of its new sales record of RM2.31 billion for FY2010 ending 31 October which represented a 40% increase from its previous FY2009 record of RM1.65 billion. FY2010 is the third consecutive year of increase in the Group's new sales, and the seventh consecutive year since FY2004 that total Group sales have exceeded the RM1 billion mark. The Group achieved a net profit of RM251.8 million on the back of revenue totalling RM1.7 billion in FY2010, representing an increase of 47% and 24% respectively over the results for the preceding year. President and chief executive officer Tan Sri Liew Kee Sin said the sales numbers are a testament of the Group's strong branding and product desirability in all its developments and across market segments. "For FY2011, we expect all our existing projects in the Klang Valley, Johor Bahru and Penang to continue to do well. In addition, we will shortly be launching KL Eco City, our exciting new integrated green commercial development opposite Mid Valley City which should also contribute strongly towards the targeted RM3 billion new sales." NAZA-TTDI said some 90 per cent of its 'Viola' residential project in Alam Impian, Shah Alam, were booked on the launch day itself. The latest offering follows the succesful launch of TTDI Alam Impian's "Spira", the township's first phase of residential development which completely sold out in only 3 days. Naza-TTDI said the "Viola" will raise further the benchmark for modern living. The latest project marks the developer's second residential development phase for its Alam Impian township that promises to offer home owners a unique urban living experience that's ideal for the modern family. Setting itself apart from conventional townships, this new precinct will bear four different elegant contemporary home layouts encircling pockets of parks to provide residents with wholesome and vibrant community living. The Viola offers several designs and layout plans with spacious built up areas ranging from 1,952 sq ft to 3,116 sq ft. It is located strategically in Shah Alam and is accessible via several highways such as, NKVE, KESAS, ELITE as well as the newly completed LKSA highway. "We are certain that with Viola, we are one step closer to reaching our aim of making TTDI Alam Impian the township of choice for growing modern families in and around Shah Alam," group managing director SM Faliq SM Nasimuddin said in a statement yesterday.